In all honesty it has been the best investment we have ever made for our cats and family home. Before we had the enclosure built, we were constantly battling a very much loved cat but also quite a handful. Constant cat fights in the neighborhood, bird killing which included robbing bird nest, wandering behavior which is normal but becoming a problem with our neighbors and the risk of the busy street. We new we had to do something and when i search on the internet i was surprised to find lots of good information to support keeping cats indoors and having an outdoor enclosure so they still get the benefit of living in the real world. Skittles was about 3 years old when we built the cat enclosure and never being one to be indoors, we were worried if she would get bored easily, but 3 years on, she is still happy and we know she is safe from the road and protected. Her favorite thing is to lay in the sun and rub on the Cat Max netting while enjoying the view around her. I believe its benefited all our family, we have less stress knowing our much loved cats are safe and happy in there home and less stress in the neighborhood, its so versatile we use it when we go out for the whole day knowing they’re having a great time in their enclosure and it has part of a garden in it, so they get to enjoy their mondo grass and cat mint. We are even planning an extension for next year and we will definitely incorporate Cat Max netting in our designs. Caboodle Shade Cover: The Catmax Caboodle Shade Cover is a great way to protect your cats against the strong summer sunlight or wet winter rain. An excellent accessory to have some extra peace of mind ! 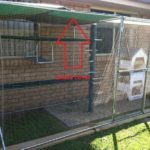 Air tunnel: The Catmax air tunnel is the best way to link safely your new Caboodle enclosure to your house so your cats can come and go as they please. Built with marine grde carpet, galvanized steal and clearnet ; it will look like part of your enclosure and last you a very long time. And it's perfect if you rent as you can take it down and bring it with you if you move houses ! Caboodle Door: If you would like to have easier access to your new Catmax Caboodle you can upgrade to a caboodle door instead of a zipper for only $200.00 which is made of galvanized steal same as the caboodle frame which won't only make it blend but will last you a very long time. Caboodle Net Guard: When your Clearnet Caboodle requires protection from family dogs, teething kittens or even snakes, that's when you need the strength of Catmax Net Guard. Made from durable, open-weave, UV-stabilised material, each strand of a Catmax Net Guard contains fibreglass fibres for added strength. 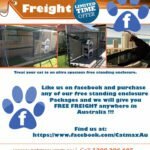 Copyright © 2013 Catmax International Pty Ltd. All rights reserved.